COLORADO SPRINGS –The McAllister House Museum is pleased to announce that Eric Metzger has been hired as the organization’s first Executive Director. Mr. Metzger brings with him over 20 years of museum experience, most recently as the Museum Services Director at the Metropolitan Waterworks Museum in Boston, Massachusetts. The Executive Director position at the McAllister House was facilitated by a multi-year operating grant from El Pomar Foundation. In this new position, Mr. Metzger is charged with bringing greater visibility to the McAllister House Museum and implementing the organization’s strategic vision. Mr. Metzger will also be spearheading new marketing, and development initiatives for the organization. The McAllister House Museum is a National Historic Landmark that has been owned and operated by The National Society of the Colonial Dames of America in the State of Colorado (NSCDA in CO) since 1961. “Our organization’s primary interest is in preserving the house as a major part of Colorado Springs history” says NSCDA in CO McAllister House Chairperson Terry Thatcher. “I very much appreciate the commitment shown to this goal by El Pomar Foundation, making it possible for us to hire a qualified museum professional such as Mr. Metzger as our new Executive Director. In 1862, Henry McAllister volunteered for service in the Civil War and served under General Palmer in the Fifteenth Pennsylvania Cavalry achieving the rank of major. The House was built in 1873 for Major McAllister and his family and is the oldest brick house in Colorado Springs. It was designed by architect George Summers and the woodwork was done by Winfield Scott Stratton. The McAllister House is located at 423 N. Cascade Avenue, in Colorado Springs one block west of the downtown business district and near Colorado College and the Colorado Springs Fine Arts Center. For general museum information visit www.mcallisterhouse.org or call 719-635-7925. For further inquiries or partnership opportunities at the McAllister House Museum, please contact Eric Metzger at mcallister.director@gmail.com. Today members of the El Paso County Pioneers’ Association came to the museum to present a check in the amount of $1,000 to help us with the cost of repairs to the museum. Chairman Terry Thatcher gratefully accepted this check and we can guarantee it will be put to good use. Following, in pdf format, is the wonderful letter they included with their check. Be sure to read Bill Vogrin’s article in the November 5, 2014 Colorado Springs Gazette writing about our effort to obtain funds to make repairs to the Museum. We are so grateful for the talents and expertise of our wonderful curator and our docents who provide the tours and educational opportunities for visitors and students. 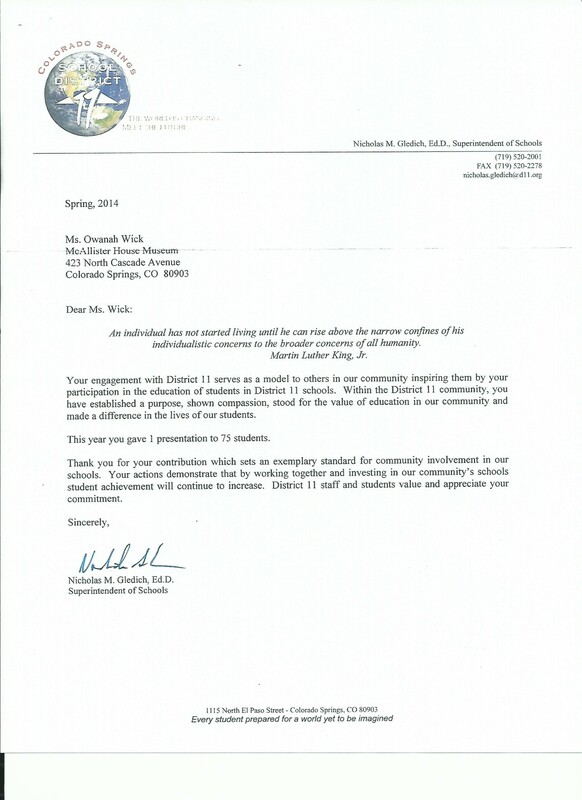 Their fine work was recognized this year by the Superintendent of Schools of School District 11 in Colorado Springs. Thank you to all our docents and especially our curator! Today was a beautiful day and so several ladies from the After Hours Garden Club raked and cleaned up the yard at the museum. What would we do without so many wonderful people helping us?! A special thank you to Aspen Glass which is donating the replacement glass for the pane in the children’s bedroom as well as coming back to replace two cracked panes in the same window. We are so grateful for the support of such a fine Colorado Springs business.